Tanba Toji has about 300 years of history, and how was the culture and tradition inherited? Sasayama city is the home of Tanba Tojis. It was a hard age that farmers left home for extra money because of the severe winter climate 350-400 years ago. It’s not only the weather that suffered the farmers, but the quota of contribution was so heavy that they couldn’t help but go to Itami for sake making to earn extra money. The image that the brewer owner had for Tanba Tojis was that they make good sake. They not only make good sake, but also grow crops. The reputation that Tanba Tojis had is still the same from the past till now- they make good sake, but they also grow crops as well. In the long history of Tanba Tojis going out for money, there were times that even though Tojis tried their best to harvest the crops they still couldn’t reach the quota due to the bad weather. However, the landlords thought it was because the farmers were making sake that they harvest decreased. As a result, the landlords started to ban the farmers from making sake. There is a saying that because the farmers were banned from making sake for extra money, there were a period of time that farmers rose several riots against the ban. Since farmers couldn’t live without making sake, there was a young man volunteered to make an appeal to the the government. But before the appeal reached to the government, the young man was put into jail. That young man was the representative figure of Tanba Toji. He was originally from the Ichihara village of Konda Sasayama city, named ICHI. ICHIHARA SEIBEI was once released from the jail, but as he went for the second appeal about the ban and also decreasing the quota he was killed by the killers sent by the landlords. 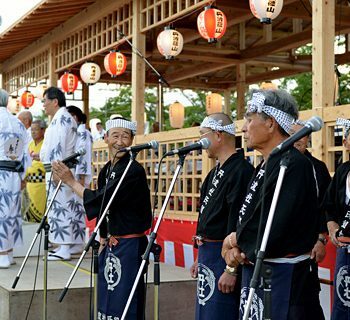 Tanba Toji really has a long history, and in every autumn, everyone will get together at the memorial hall of Tanba Toji. When everyone gets together, the chief priest of Kyoto Matsuo Taisha Shrine will be asked to perform the purification ceremony, and Tojis will provide libation to ask for the safety for all people and also the great flavor of sake for the year in front of the statue of ICHIHARA SEIBEI. This ceremony has been held every single year, and has been part of the tradition of Tanba Toji. Please tell us about your memories with senior Toji. After graduating from high school, we went straight for farming. After finishing harvesting the crops, we would leave the home for sake making. 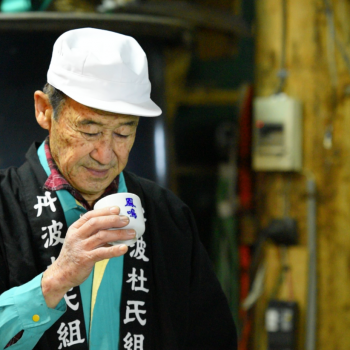 Since Tanba Tojis has great reputation, we had to listen to the seniors when making sake. We needed to involve ourselves in sake making with being proud of being part of it when we worked. The brewer was filled with male workers in the winter, and the first thing that we needed to do was listen to the seniors. After that, we just copied what the seniors did and focused on our own sake making. Just like now, people would listen to their supervisors and ask for their counsels, and we would do the same. We can’t show the attitude that sake making doesn’t matter to me or that I am not in the mood of making sake when we were in the work because these emotions will not help us make good sake. It’s the same with working in the company. When people have the right attitude, they will be able to everything. The seniors would not tell us to do this or do that, we just need to copy their actions. And that’s how we remembered the process of sake making. If we want to go for higher rank in the brewer, we not only need to make sake, but also remember the 7 sake songs. In the past because there was no orchestra, we would sing with the drum. It was men’s society, so we counted the time according to the section of the song we sang. After singing one song, we would know the time, and after that, the leader would sing one song, and the rest will sing along with him. If the leader wanted us to work a little bit more, he would sing the second song, or the third song. The time singing song was counted as work in the past days. Since singing songs makes the atmosphere of the brewer softer, when building brewers, people would build brewers next to each other. In the evening, the other people would hear the voice of us singing, and know that we were making sake. Nowadays, there are fewer and fewer places that would sing songs along with the work. As a result, we would get together once in a month to practice the sake songs, just hope that the songs can be passed on to the next generation. During the process of sake production, makers, including me, need to go to several places in Hanshin area. And when the makers were out, the rest of the families need to take care of themselves. 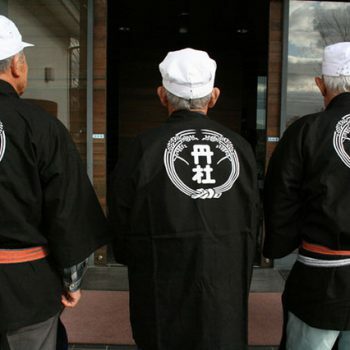 It is because of the families that we, sake makers can focus on making sake without resting for years. This is what I am extremely grateful for the family. However, since sake making is not an easy job, I think while the families took care of themselves, they were also worrying about me. In the mornings when I need to go to other areas for sake making, I would take a sip of the libation. When I took the libation, I would take three dried fish to drink with it, pray to God of UJI and tell Him that I will not be back until spring, please bless me that I will be able to come back home healthy and make good sake. 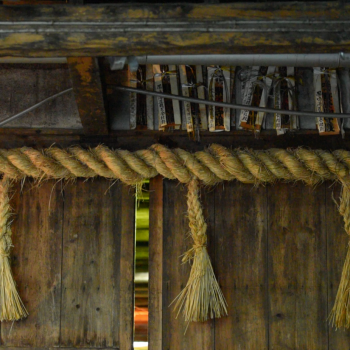 Differece between the sake making in Tanba and in other area. I grew up in Hanshin area, which is a area that the major brewers are in. I think it’s fate that brought me to Tanba area and start making local sake. The differences are the local makers here use local material to make local sake and sell the sake to local people, while the major brewers sell their sake to people all around the nation. We, local brewers sell sake and hope that people would start to fall in love with our place, but the major brewers, since their audience is different from us, how they make sake is different as well. What are the tips from Toji about enjoying and tasting Sake? Sake, as all of you know, is alcohol. During the cold winter, people would open the cap of the bottle of sake and pour it into a cup. While it’s being poured, you can smells the good smell of sake; however, it means the high-quality sake is being evaporated. What would recommend is just drink it from the bottle, and it will be best if the chilled sake is drunk with food. In the past, people usually drank the canned sake, but right now, the young generation seems to enjoy it more when drink it all at once. Well, it looks cool, but I feel like the high-quality alcohol would be evaporated before drinking… and if the sake is canned, this situation can be avoided. It will be the best if the sake can be tasted with delicious food. The Tanba Toji Association is now actually involving young people and even female in making sake. There are conference about sake production being held every summer, and this summer will be the 117th. The participants used to be the older generation, but recently, most of them are the younger generation and female. This trend shows me that sake, and sake making will for sure not decline since it represents the nation. The time has come to a situation that the young people would work at companies while involving themselves in sake making. And what they are doing really makes the sake industry more promising! Tanba Tojis are now cultivating young people to become Tojis.